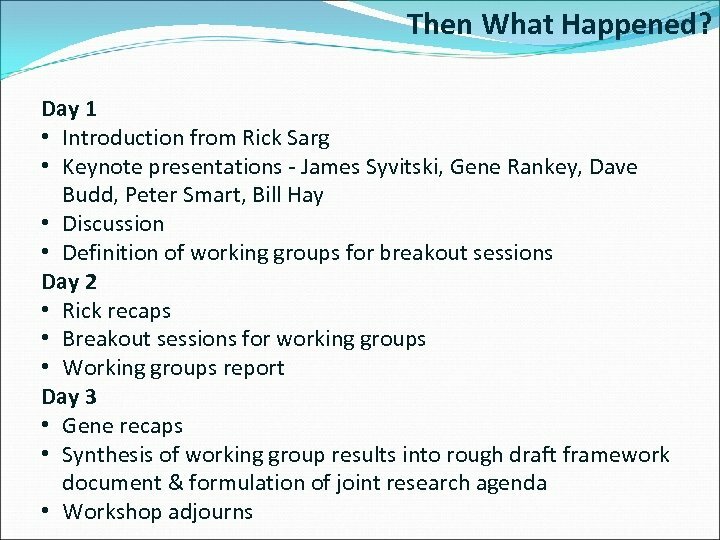 Review of the 2008 Meeting Attendees: Rick Sarg, CSM – co-convener Evan Franseen, Kansas GS – co-convener Gene Rankey, Univ. of Miami – co-convener Dave Budd, Univ. of Colorado-Boulder Bob Demicco, Binghamton Univ. Andre Droxler, Rice Univ. Ben Gill, Univ. of California-Riverside Cedric Griffiths, CSIRO, Australia Pamela Hallock-Muller, USF, St. Petersburg Bjarte Hannisdal, U. Bergen, Norway Bill Hay, University of Colorado Museum Jon Hill, Edinburgh, UK Linda Hinnov, Johns Hopkins Univ. Chris Kendall, Univ. of South Carolina H. Rich Lane, NSF Timothy Lyons, Univ. of California-Riverside Bernhard Riegl, Nova SE Univ. 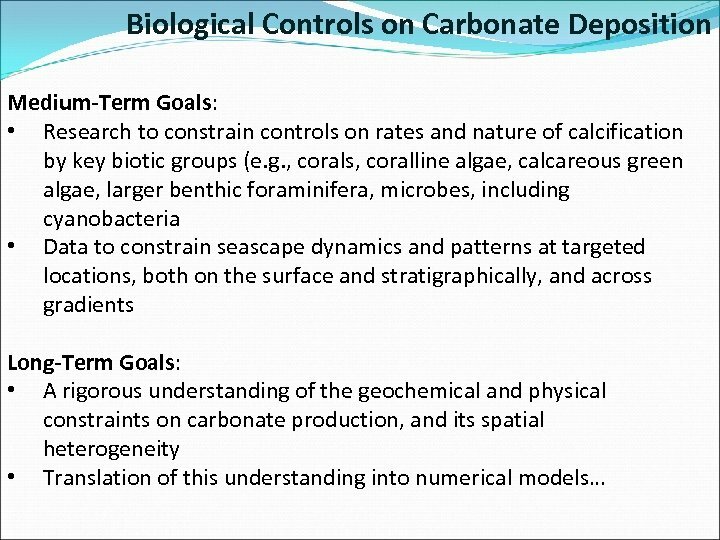 , FL Andrew Ashton, Woods Hole Oceanographic Inst. Jody Webster, James Cook Univ. / U. of California-Davis Pete Smart, Bristol Univ. , UK James Syvitski, Univ. 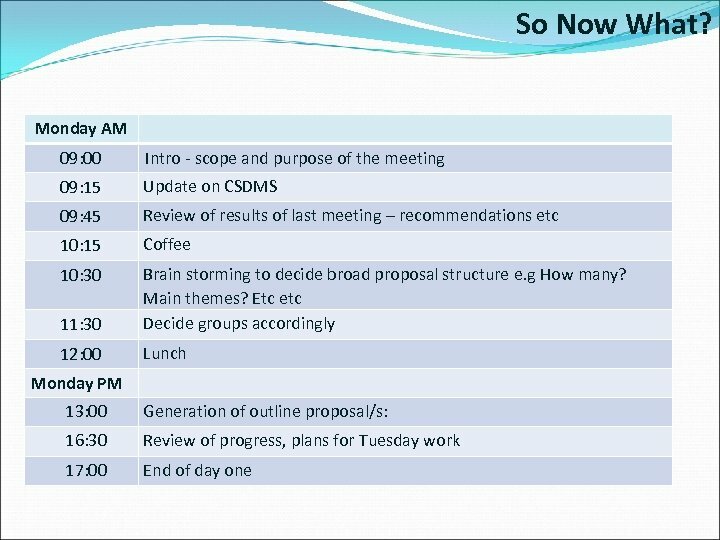 of Colorado – Boulder/ CSDMS Albert Kettner, Univ. of Colorado – Boulder / CSDMS Eric Hutton, Univ. 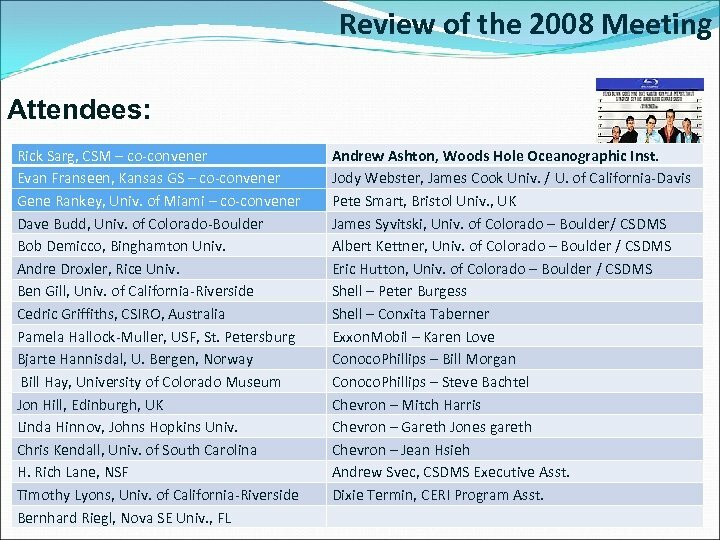 of Colorado – Boulder / CSDMS Shell – Peter Burgess Shell – Conxita Taberner Exxon. Mobil – Karen Love Conoco. Phillips – Bill Morgan Conoco. Phillips – Steve Bachtel Chevron – Mitch Harris Chevron – Gareth Jones gareth Chevron – Jean Hsieh Andrew Svec, CSDMS Executive Asst. Dixie Termin, CERI Program Asst. 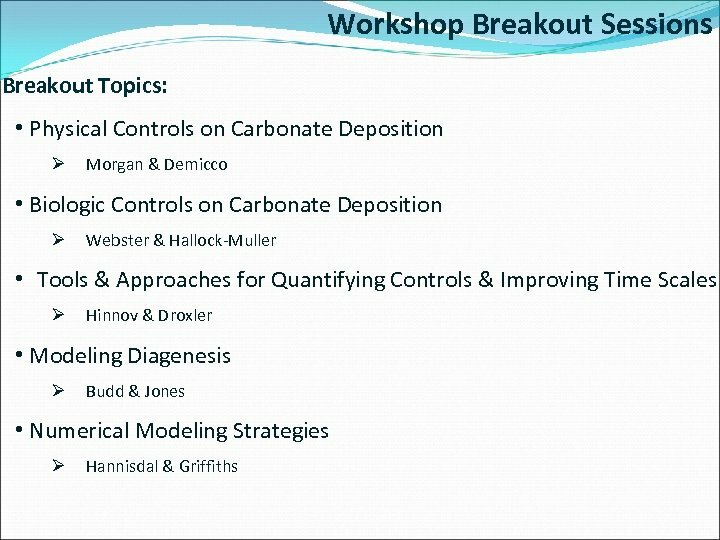 Workshop Breakout Sessions Objectives for each Breakout Group: 1) Current level of knowledge – qualitatively & quantitatively. 2) What are our grand challenges for the future? 3) What are our knowledge gaps? What experiments are necessary to close those gaps? 4) What kinds of data do we need, and who are the necessary partners? 5) Concise white paper summary. 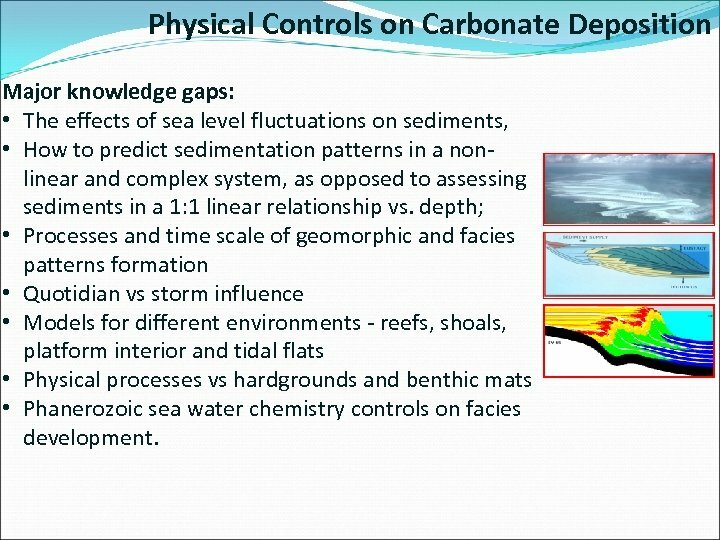 Physical Controls on Carbonate Deposition Major knowledge gaps: • The effects of sea level fluctuations on sediments, • How to predict sedimentation patterns in a nonlinear and complex system, as opposed to assessing sediments in a 1: 1 linear relationship vs. depth; • Processes and time scale of geomorphic and facies patterns formation • Quotidian vs storm influence • Models for different environments - reefs, shoals, platform interior and tidal flats • Physical processes vs hardgrounds and benthic mats • Phanerozoic sea water chemistry controls on facies development. 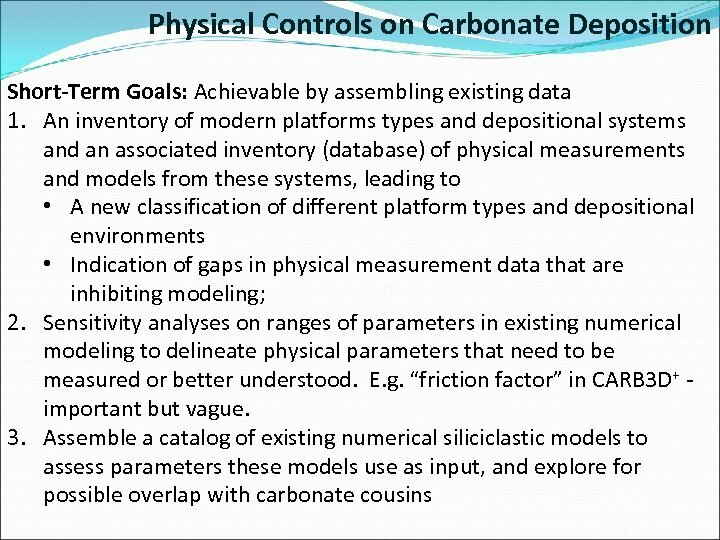 Physical Controls on Carbonate Deposition Medium-Term Goals: 1. Collecting oceanographic measurements (waves, tides, and currents) across one or two different platforms. 2. Development of preliminary “sector models” of various specific environments to provide “modular” input to a larger community model. 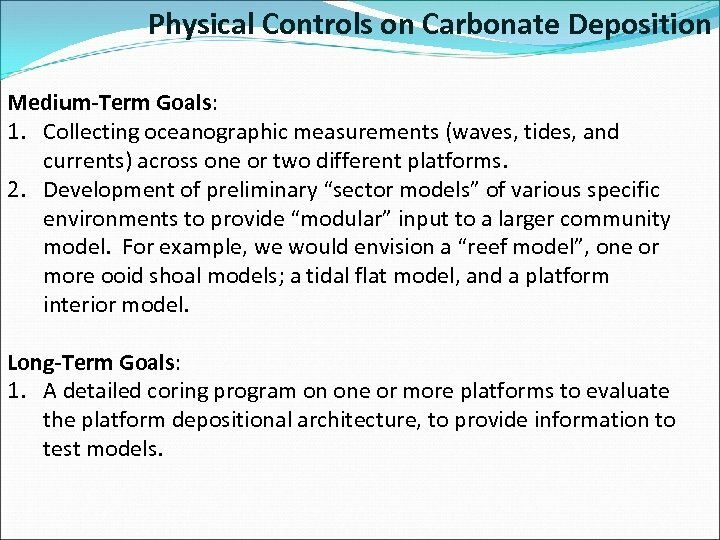 For example, we would envision a “reef model”, one or more ooid shoal models; a tidal flat model, and a platform interior model. Long-Term Goals: 1. A detailed coring program on one or more platforms to evaluate the platform depositional architecture, to provide information to test models. 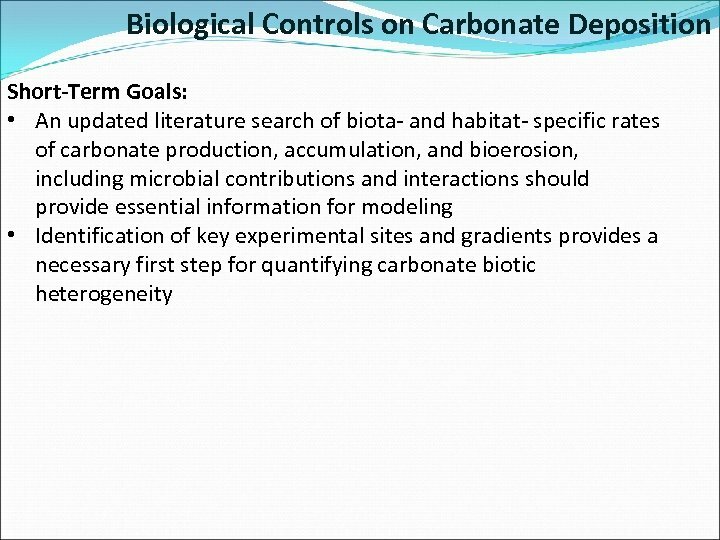 Biological Controls on Carbonate Deposition Major knowledge gaps: • Lack of quantitative understanding of • The boundary conditions for hypercalcification • Rates of production and how they relate to rates of deposition & accumulation • Relative rates of bioerosion and physical erosion • The nature and origins of spatial heterogeneity Basic questions • How do carbonate producing communities function and how does the sediment produced accumulate? • What is the relative importance of different biota under different boundary conditions? 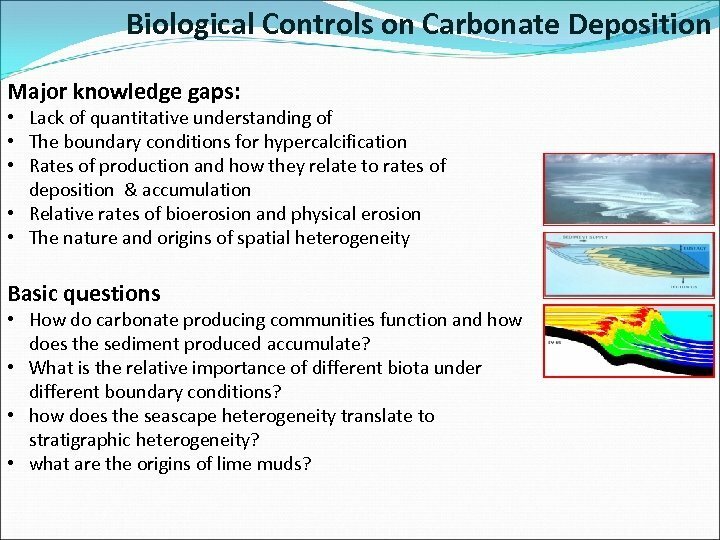 • how does the seascape heterogeneity translate to stratigraphic heterogeneity? • what are the origins of lime muds? 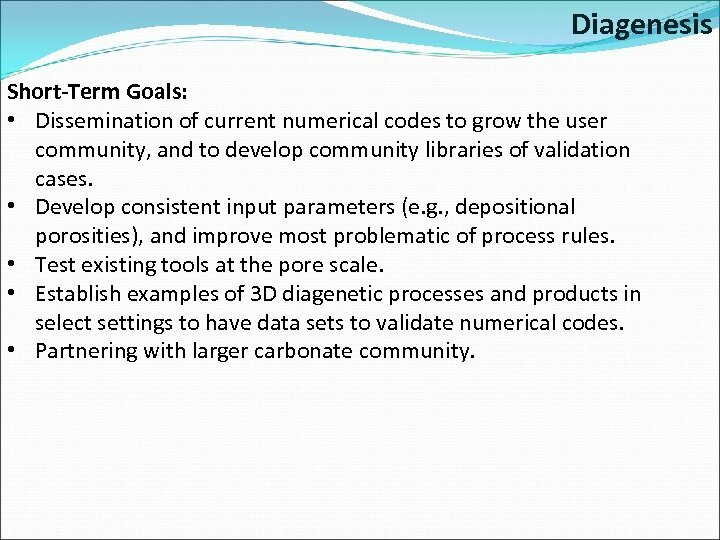 Diagenesis Short-Term Goals: • Dissemination of current numerical codes to grow the user community, and to develop community libraries of validation cases. • Develop consistent input parameters (e. g. , depositional porosities), and improve most problematic of process rules. • Test existing tools at the pore scale. 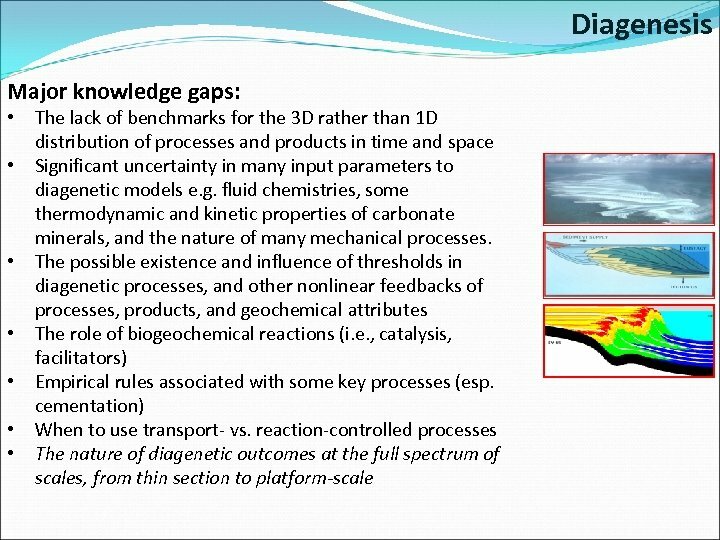 • Establish examples of 3 D diagenetic processes and products in select settings to have data sets to validate numerical codes. • Partnering with larger carbonate community. 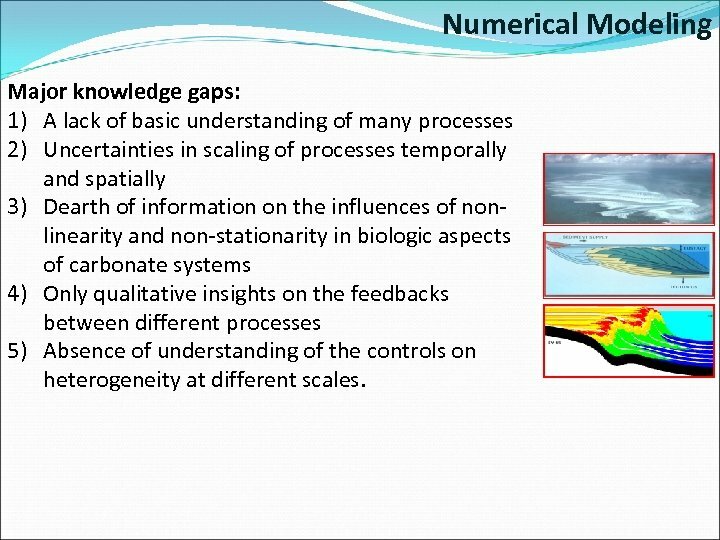 Numerical Modeling Major knowledge gaps: 1) A lack of basic understanding of many processes 2) Uncertainties in scaling of processes temporally and spatially 3) Dearth of information on the influences of nonlinearity and non-stationarity in biologic aspects of carbonate systems 4) Only qualitative insights on the feedbacks between different processes 5) Absence of understanding of the controls on heterogeneity at different scales. 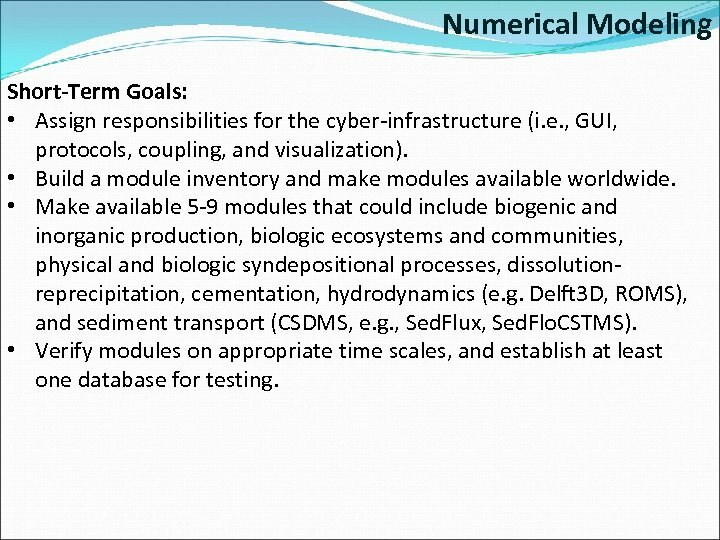 Numerical Modeling Short-Term Goals: • Assign responsibilities for the cyber-infrastructure (i. e. , GUI, protocols, coupling, and visualization). • Build a module inventory and make modules available worldwide. 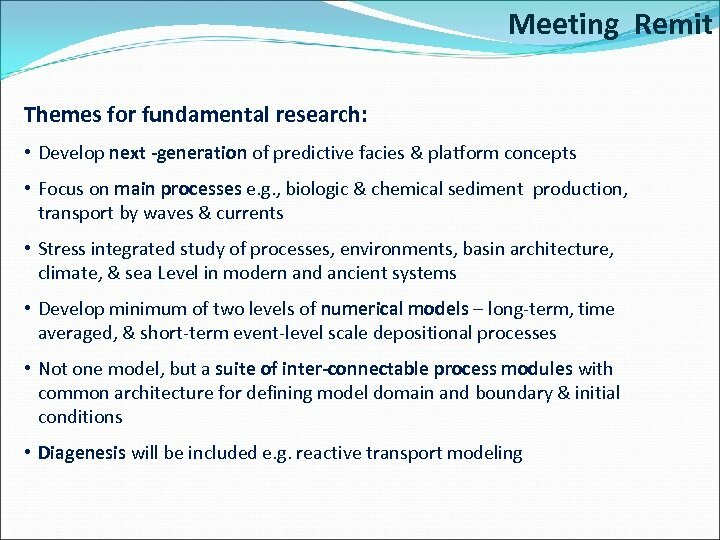 • Make available 5 -9 modules that could include biogenic and inorganic production, biologic ecosystems and communities, physical and biologic syndepositional processes, dissolutionreprecipitation, cementation, hydrodynamics (e. g. Delft 3 D, ROMS), and sediment transport (CSDMS, e. g. , Sed. Flux, Sed. Flo. CSTMS). • Verify modules on appropriate time scales, and establish at least one database for testing. 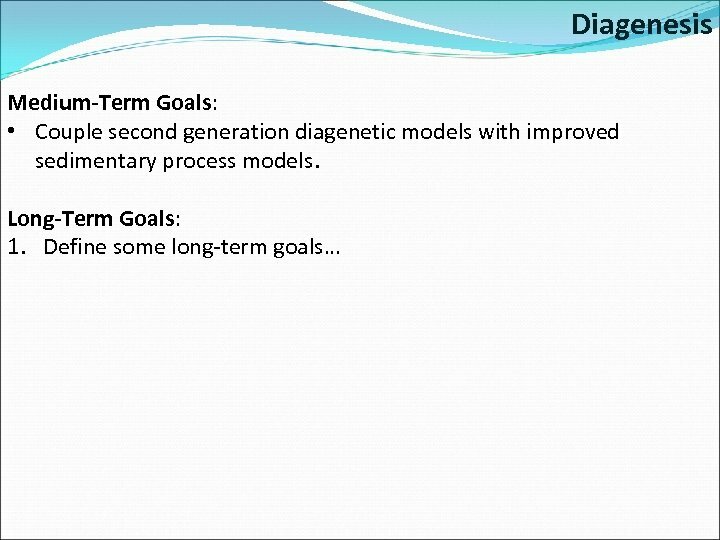 Numerical Modeling Medium-Term Goals: • • Involve students from geophysics, applied math, and computer science fields Have stage 1 modules tested and improved. 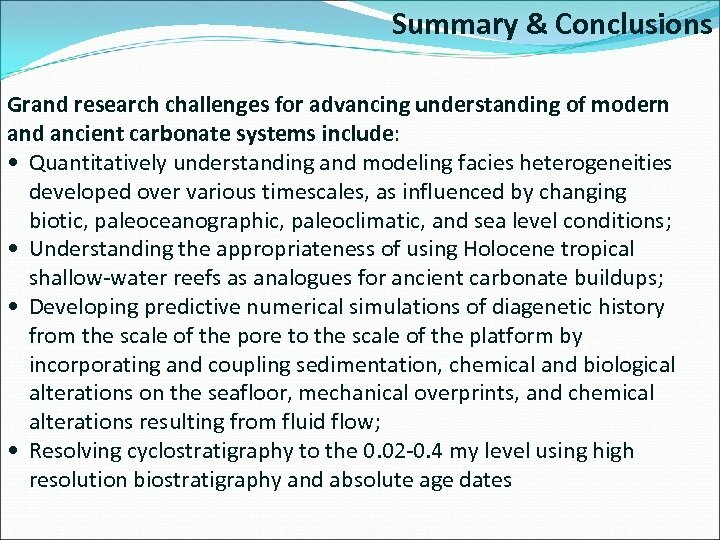 Document modules and begin coupling with climate/ocean/siliciclastic models. Conduct initial sensitivity studies, and complete a comparative numerical scheme study. 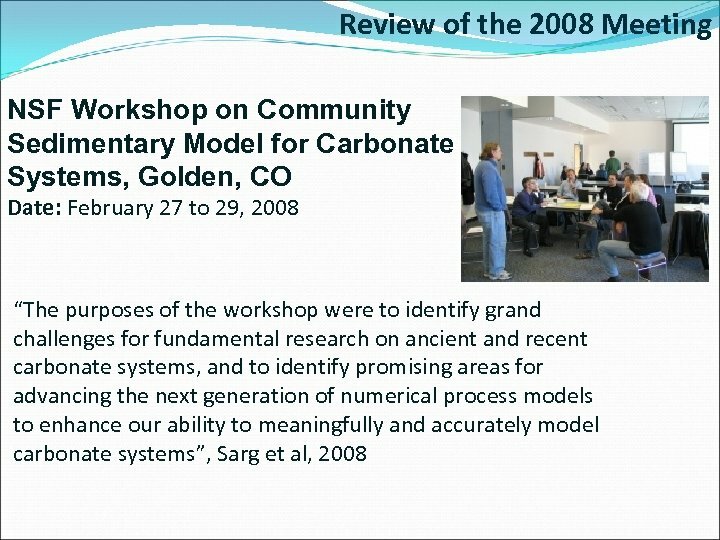 Conduct two international workshops in carbonate computational issues, and achieve “buy-in” with non-NSF funds for module development. Ensure high performance computing access, and activate partnerships. Have modules running efficiently on HPC, and have at least one useful prediction. 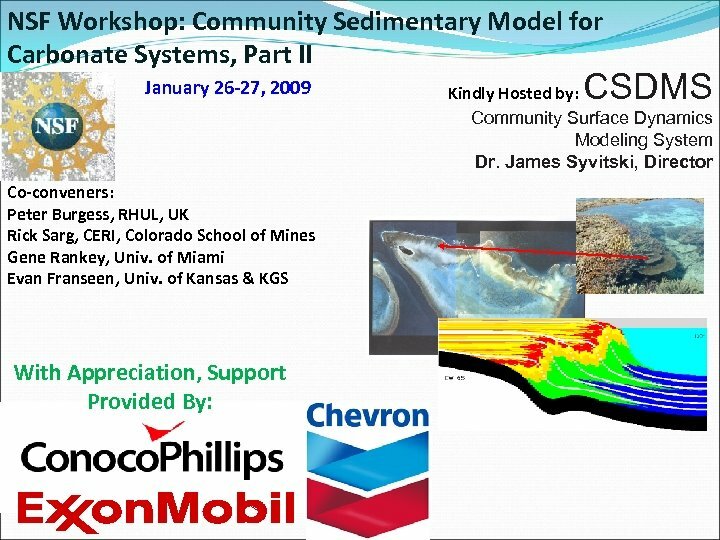 Publish a series of peer reviewed papers using the workbench modules, and conduct a number of sedimentology courses in US using the carbonate workbench as a lab tool. 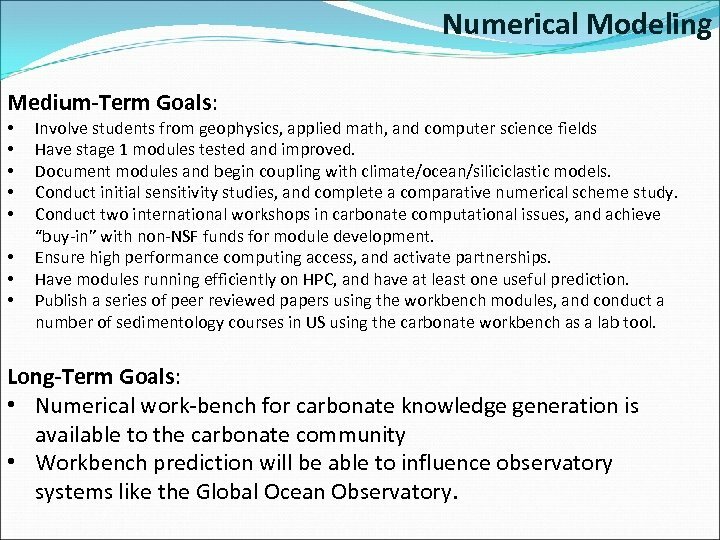 Long-Term Goals: • Numerical work-bench for carbonate knowledge generation is available to the carbonate community • Workbench prediction will be able to influence observatory systems like the Global Ocean Observatory. 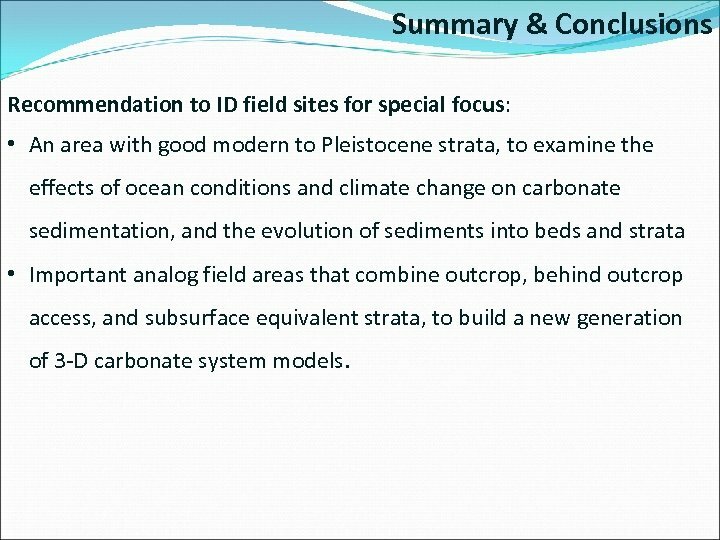 Summary & Conclusions Recommendation to ID field sites for special focus: • An area with good modern to Pleistocene strata, to examine the effects of ocean conditions and climate change on carbonate sedimentation, and the evolution of sediments into beds and strata • Important analog field areas that combine outcrop, behind outcrop access, and subsurface equivalent strata, to build a new generation of 3 -D carbonate system models. So Now What? 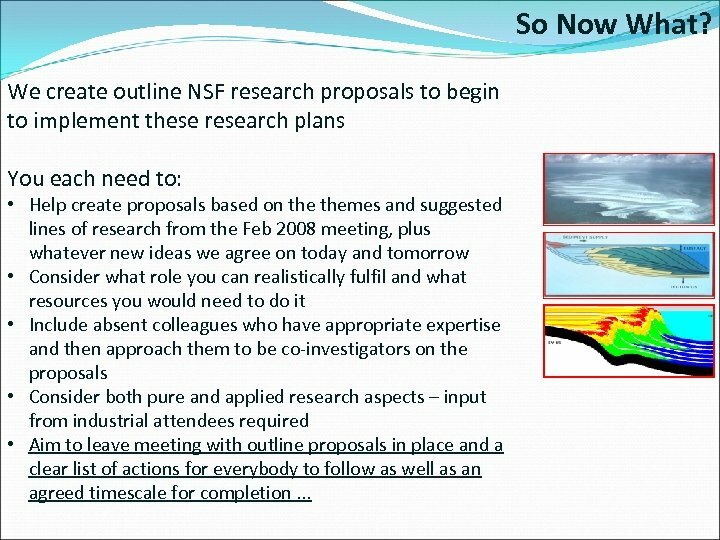 We create outline NSF research proposals to begin to implement these research plans You each need to: • Help create proposals based on themes and suggested lines of research from the Feb 2008 meeting, plus whatever new ideas we agree on today and tomorrow • Consider what role you can realistically fulfil and what resources you would need to do it • Include absent colleagues who have appropriate expertise and then approach them to be co-investigators on the proposals • Consider both pure and applied research aspects – input from industrial attendees required • Aim to leave meeting with outline proposals in place and a clear list of actions for everybody to follow as well as an agreed timescale for completion. . .